Rest In Peace Prabuddha Dasgupta. The ace photographer passed away last evening after enthralling us with his beautiful photographs, be it on fashion or Ladakh. Dasgupta died of a massive heart-attack while he was traveling in a cab. He was only 51. God bless his soul. Both the designers – Manav Gangwani and Sabysachi Mukherjee requested all for a minute of silence for the legendary Prabuddha before their shows. Manav Gangwani had a mishap while he was preparing for the Couture Week. His assistant disappeared with all the designs. Gangwani reworked on an entirely new collection and there were flashes of brilliance. 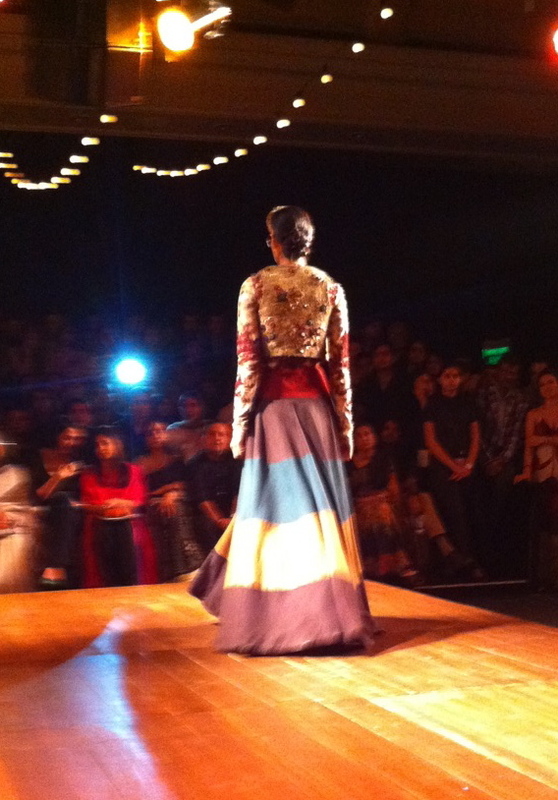 A monochromatic collection had sequence in red and as expected, was high on ‘Bling’. For the first time during the week I saw some dramatic elements that I feel is an integral part of a couture show. (Of course there was Manish Arora who had loads of drama in his show.) My personal favourites were the black and white sheer gown with a bejewelled black structure crossing over the shoulders and a short one-shoulder dress with nice lacy applique work. I liked the finish and the fit – a must for any couture ensemble. Manav Gangwani had the Queen of Bhutan – the beautiful Jetsun Pema gracing the front-row in a chic one-shoulder black Gangwani dress. Oh yes Bollywood was there in form of Raveena Tandon, Sophie Choudhry and jewelery designer Farah Khan. Sabyasachi Mukherjee had one of the most elaborate set – with a vintage feel complete with the ramp depicting a wooden floor. And much to my liking I saw a great deal of ‘newness’ in his collection. But then he stuck to the ‘no makeup’ look and glasses for his models. There were the usual ornate lehengas, long-sleeved blouses and pretty sarees but what impressed me were those long voluminous skirts totally devoid of embellishment in solid colour like green or in colour-blocking technique. 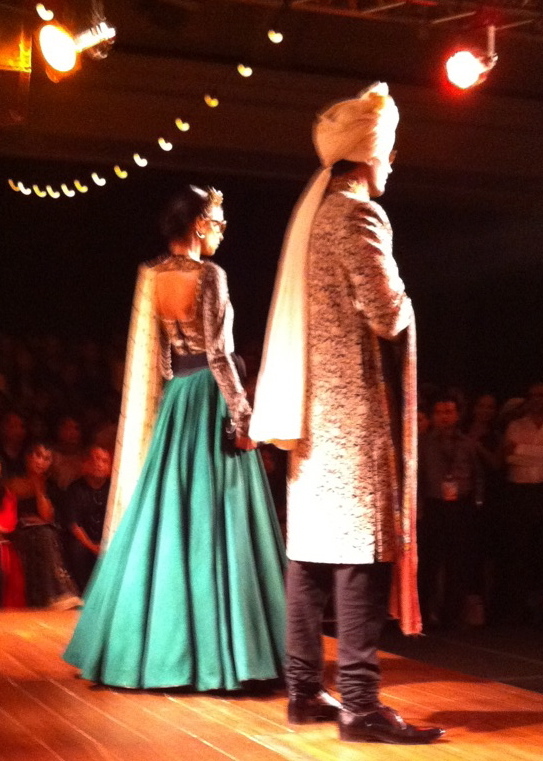 Sabya even went for coarse fabric and thick cotton to craft out these maxi skirts that can be doubled as lehengas. 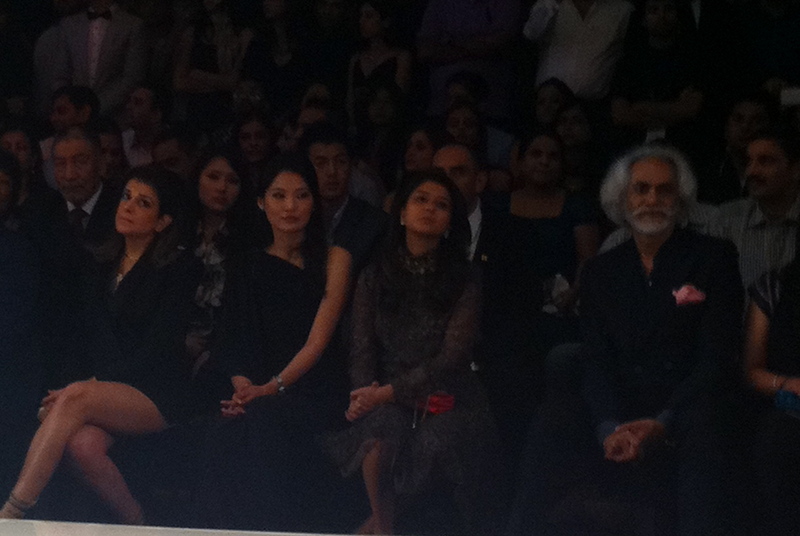 Sridevi and her director for their forthcoming movie – English Winglish, Gauri Shinde were Sabyasachi’s showstoppers. Who is that leg beside the queen of Bhutan? Hello! I simply wish to give an enormous thumbs up for the good data you’ve gotten here on this post. I will probably be coming back to your blog for more soon.